What makes the best wedding? What helps create the day you pictured with the job that we do? Planning. Its all about planning when your looking for perfection. At Base Entertainment, the work for your wedding doesn't start two hours before the event on the day of, it starts from that first consultation. We show you the tools we have created to make it easy on you to plan the biggest day of your lives. Nothing says more about a company than winning awards for the work they do. At Base we have won quite a few and are proud to be able to tell our customers, we earned it. Years of experience, hard work, and training make us an easy and trusted choice. -A Two Man Team of a DJ and an Emcee for the duration of your wedding package. -Sound and Dance Floor Lighting for your reception. -Wireless Microphone and a backup corded mic. -Online Planning Suite with your timeline, playlist, and request builder. -Two Consultations in our office face to face. Dance floor lighting is meant for one thing, the dance floor. We use our lighting responsibly and never let our lights interfere with special moments. 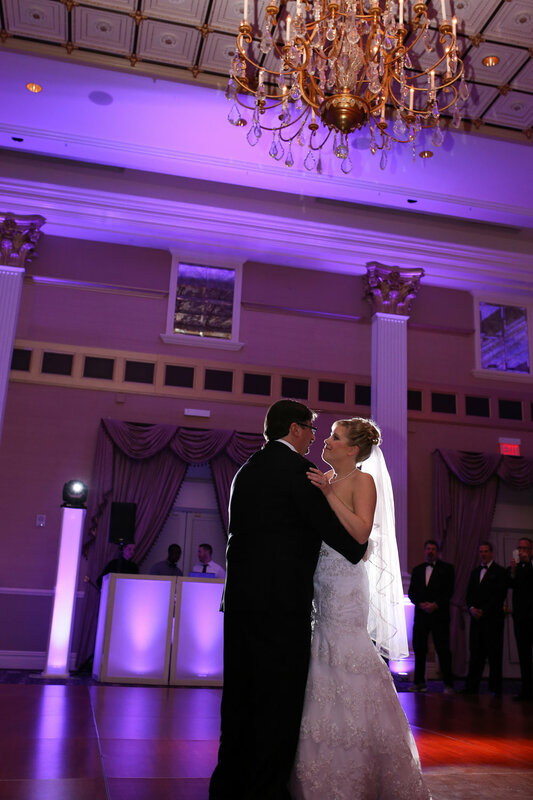 We have everything from basic packages to our computer controlled lighting that can be used to spotlight your doorways during introductions, first dance, toasts and more! This type of lighting is meant to create and ambient and still effect that will enhance the space for your event to be a little more personal.This type of lighting is a static effect that will look great in the background of all of your photos throughout the event. Uplighting enhances your space with personalized color or light. Choose your events color scheme or simply go with a soft white/candle light for a beautiful glow around the room that give an amazing background to your photos. Purple Uplighting with our Luminate Dance Floor Lighting and Lighted Centerpieces. 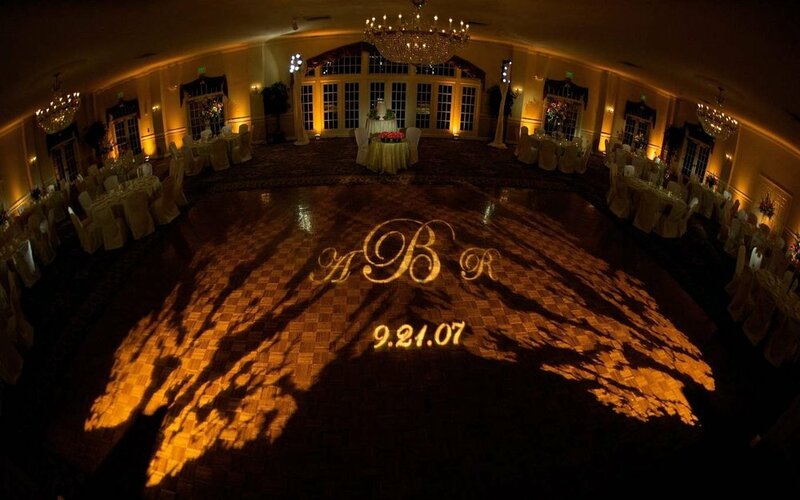 Some call it your name in lights, some call it a gobo, doesn't matter what you call it, all you need to know is this is what it looks like and it is an impressive addition to your event space on your big day. Used to create lighting design on the walls, ceiling, or floors. We can use a variety of patterns or themes to customized a unique creation at your venue. We provide the lighting source, you provide your own centerpiece, they look amazing and are programmed into the rest of our lightshow, or can run seperate. Awesome option if you want to dance under the stars all night! Stunning effect! A classic and beautiful look. A seperate speaker for a seperate area with its own music supply for a period of one hour. This includes the speaker, music source, and one hour of overtime for the staff as well. Being able to be heard during your wedding ceremony is important. Having music as you make your way down the isle is also important. 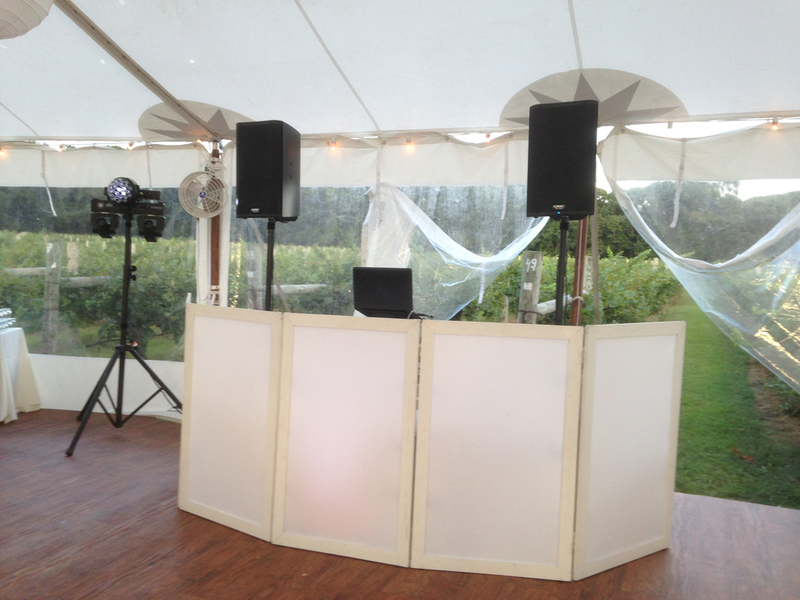 Our ceremony system includes the DJ, Music Source, Speaker, and a wired or wireless microphone. We also include the one hour of time for the ceremony, 30 minutes of time before hand for waiting music while guests arrive, and a half hour allowance for the ceremony as well. Available if needed, one is always included in your package. Available for patios ad separate rooms! For the extra moments that you need, we have something for all of them! Check with us to see if we have your date available.